Most bar menus boast a reliable burger, plate of wings, and, if they're claiming to be "a pub", fish and chips. But not Sun King. 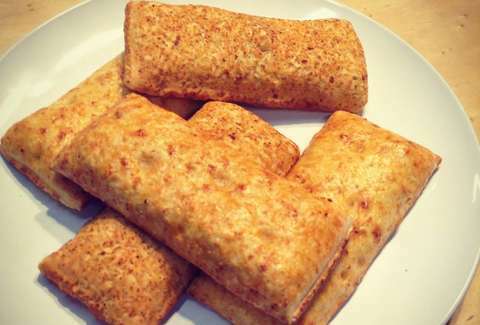 When the Indiana brewery was forced to add food options to their taproom menu, they went with strictly microwave-to-table fare, including your fallen idol, Hot Pockets. Sun King had previously only offered growler fills and tastings in its taproom, which meant it could skirt Indiana's state law that says "premises where alcoholic beverages are consumed by the 'drink' are required to have food service available". As of Monday, though, they're selling beer flights and pints. Since they were already self-professed fans of Bank Street Brewhouse's mocking menu, the staff decided to have a little fun with their required food service, adding just four options: Hot Pockets Brand Hot Pocket, Soup-flavored Soup, Coffee, and Rehydrated Condensed Milk. Discerning diners have a choice of ham & cheese or pepperoni pizza Hot Pockets, but the soup options are a little more mysterious -- Sun King merely describes the flavors as "the essence of moisture along with some other stuff". If you're unwilling to take your chances on soup-soup, you can still grab snacks from the food trucks Sun King will have on Wednesdays and Thursdays, or order something from a nearby restaurant (Sun King has a stock of menus on hand). Indiana might want to reconsider its law, though -- at this rate, it's only a matter of time before some bar offers $15 SpaghettiOs. Unheated. Kristin Hunt is a Food/Drink staff writer for Thrillist, and thinks everyone will be ordering Hot Pockets after three pints. Follow her to business strategies at @kristin_hunt.